The Nisca PR-C201 dual-sided printer features the quality and reliability that Nisca is known for, along with the benefits of retransfer printing. It offers built-in Ethernet connectivity, fast print speeds, and exceptional print quality. A key advantage of images printed on the Nisca PR-C201 dual-sided printer is the enhanced wear protection, excellent print quality, and true over-the-edge printing that comes with retransfer printing technology. This technology also allows you to print cards with uneven surfaces (e.g., technology cards with embedded electronics) and non-PVC cards (e.g., ABS, PET, PVH and Polycarbonate). The PR-C201 card printer features a small footprint to accommodate the smallest of workspaces. An LCD panel provides complete, easy-to-read printer status messages and diagnostic prompts. And the PR-C201 printer’s quick change ribbon cassette makes reloading supplies and cleaning the internal print path easy and virtually maintenance-free! 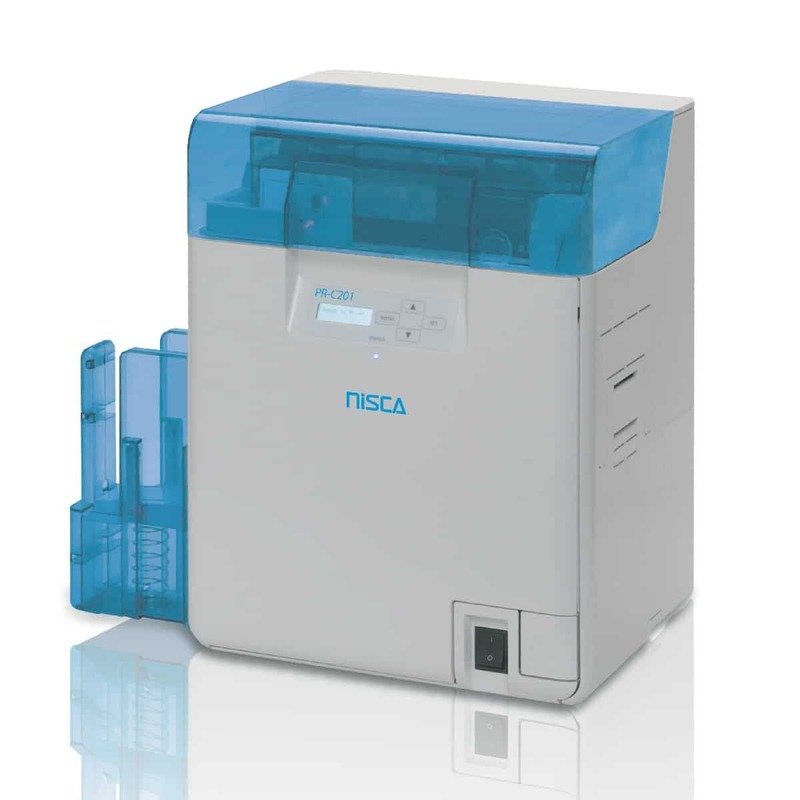 The Nisca PR-C201 offers a high speed, 600 dpi, 24-bit color, and a print speed of up to 160 cards/hour. Large input and output hoppers hold 250 cards each to support this demand. Your card issuance application does not have to be limited to one stand-alone badging station. Operate your card printing program safely and seamlessly over your network with Nisca PR-C201’s built-in Ethernet connectivity. The printer is also fitted with USB connectivity. The PR-C201 includes a two-year manufacturer’s warranty on the printer and a lifetime warranty on the printhead.